Sinja Küppers is a second-year PhD candidate. Her academic interests lie in archaic epic and lyric poetry and Second Sophistic Literature. She is particularly interested in the common themes of performance and audience, ancient mythology and the blending of genres. Sinja received a B.A. in Languages and Cultures from Antiquity (Antike Sprachen und Kulturen) from the University of Cologne and a MSt in Greek and Latin Languages and Literature from the University of Oxford. 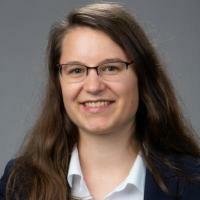 She worked with the Homeric Scholia from 2014-2016 as a research assistant to Prof. Nünlist at the University of Cologne. During the summer 2018 Sinja explored as an intern at the National Humanities Center how to apply GIS to teaching Classics. Currently Sinja is working as a Digital Lab Fellow on Mapping the Movement in the Second Sophistic Movement. Sinja has assisted in developing and teaching Ancient Myth (2018) at Duke.